Why the flu strikes hard during the winter but nearly vanishes in the summer has baffled epidemiologists for decades. 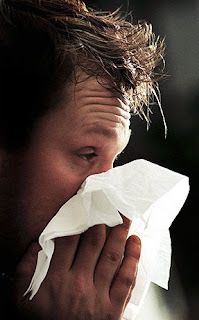 Now a new study may have the answer: Influenza germs last longer and pass from person to person more effectively in lower absolute humidity—i.e., when it's cold outside and the air is dryer. Absolute humidity is a measurement of the total amount of water vapor in the air at a given temperature. Relative humidity, a percentage, is the ratio between the water vapor present and the air's saturation point, a figure that changes with the temperature. Earlier studies of humidity and the flu had focused on relative humidity and found no link, said lead author Jeffrey Shaman at Oregon State University, whose findings appear tomorrow in the journal Proceedings of the National Academy of Sciences. After reanalyzing these past studies, which also contained data on absolute humidity, Shaman's team found a much more powerful connection. "Absolute humidity conditions explain most of these changes," Shaman said. The researchers do not know exactly what it is about low absolute humidity that the flu virus likes. But they suggest that absolute humidity levels be raised in buildings such as hospitals and medical clinics where the disease most often spreads. "This gets us a big step closer to one type of mechanism" for how the flu spreads, said epidemiologist Marc Lipsitch of Harvard University. "One really key question is how much influenza is transmitted in tropical locations"—places with high absolute humidity year-round—"and how this compares to temperate parts of the world," he said. "A satisfactory explanation would not only explain the seasonal cycles in temperate areas, but also the much less seasonal, but still substantial, burden of influenza that seems to be present in the tropics."